GWAR is the predominant project of Slave Pit Inc. and the culmination of numerous artists and musicians from nearly two decades. This is a band as well as a theatrical troupe that has been ahead of its time for many years as they smash through boundaries that no others would even contemplate. GWAR makes a mockery of the evils of society as they portray bumbling demons, demigods, and a demigoddess whilst dealing death blows to the very core of humanity. 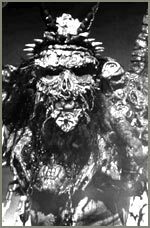 GWAR has been featured on numerous TV shows and movies along their career, mastered many albums with just about every style of music played, have been nominated for two Grammys, created countless videos, and continue to bring dominating aural and visual chaos to a cult of fans and listeners spread over generations, as well as the globe.